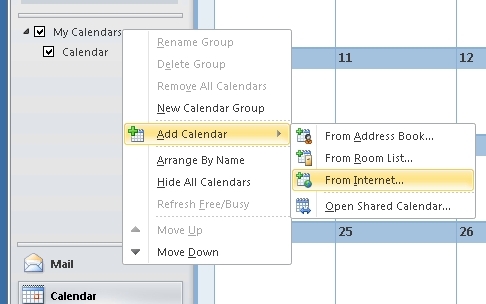 With Outlook 2010, you can subscribe to an "Internet Calendar Subscription (ICS) address". Note that some sites refer to this feed as "iCalendar" or "iCal" format. 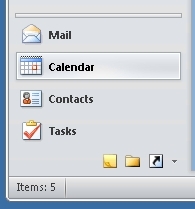 To subscribe to an ICS feed, in Outlook 2010 select "Calendar" from the lower-left pane (see Figure 1). In the left pane, you should then see "My Calendars". In the pop-up box (see Figure 3) paste (or type) the address for the calendar you want to subscribe to.